There must be a few on the way. Hurry up. We’ll take care of the resizing and cropping, you just worry about getting them off your phone. Use the USB cable if you can’t get BlueTooth working. 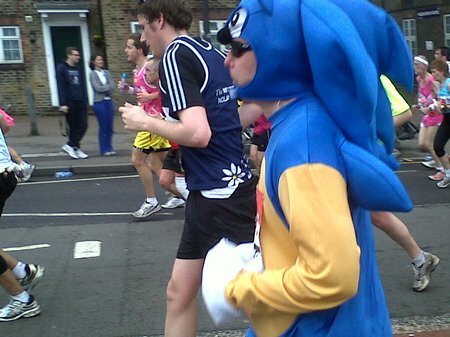 Hopefully we’ll get one of a wearer with the costume’s head off while he vomits in the post-race holding area. From a man’s blog about games. From someone’s Flickr (please don’t be a copyright nazi). I got one, but in a desperate bid to actually have some content on my site I put it up there first. I’m sorry if that’s treading on your toes a bit, please don’t shout at me. He looks a bit more knackered here though. Not wearing red trainers though, poor show. 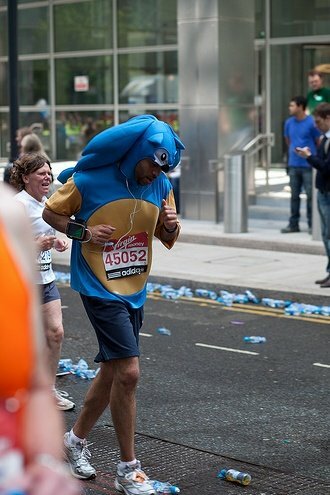 That’s london marathon running so I like it……..